Now that it’s officially spring, it’s time to bring on the salads! 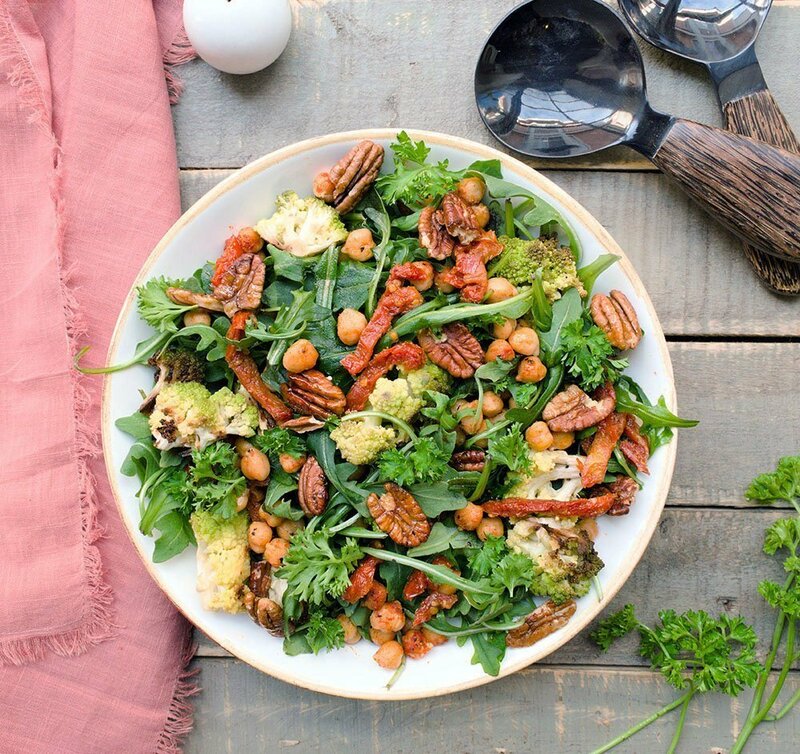 This roasted chickpea romesco arugula salad with pesto vinaigrette is a little cross between a fall and spring salad but the flavors are on point. Imagine a little sweet, a little savory, a little bitter and a little tart all in one bite and that’s what you get in this salad. 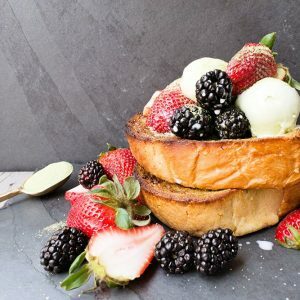 Just what you need to get you ready for summer bikinis, am I right? Well, who am I kidding, I’m going for a piece of pie right after devouring this. Make the honey roasted pecans. Combine sugar and cinnamon in a small bowl. Set aside. Stir together honey, water, and oil in a small saucepan and bring to a boil over medium heat. Add pecans and cook until the nuts have absorbed all the liquid. Remove from heat and transfer pecans to a large bowl. Sprinkle with cinnamon sugar mixture. Spread pecans onto waxed paper and let cool completely. Cut romanesco into bite-size florets. Toss with 1 tbsp olive oil, salt, and pepper. Spread in an even layer on a baking sheet and roast for 20 minutes or until the stems are tender. Remove from heat. Toss chickpeas with 1 tbsp olive oil, garlic powder, paprika, and oregano. Spread on a baking sheet and roast for 10 minutes or until chickpeas are caramelized. Remove from heat. Blend ingredients for pesto vinaigrette excluding oil. Slowly add the oil while the blender is running to emulsify the dressing. Season with salt and pepper. Set aside. Assemble salad. 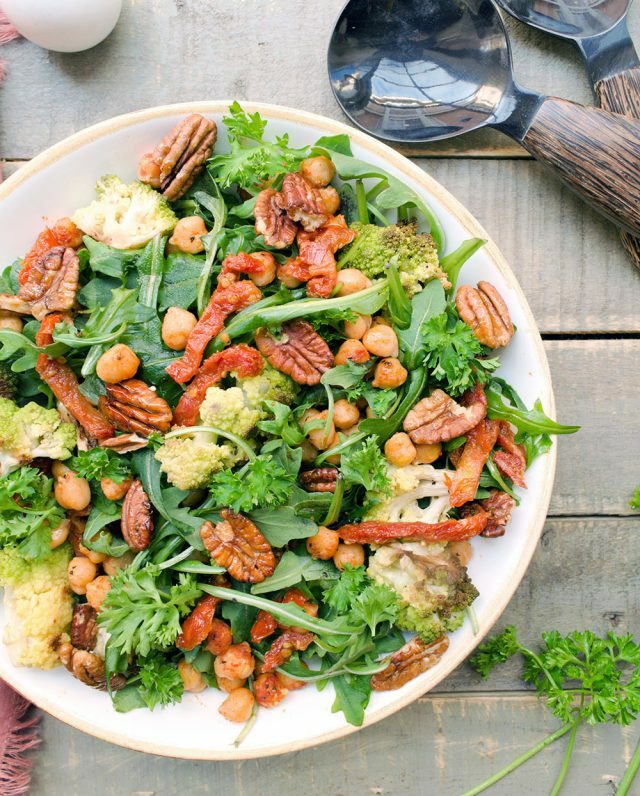 Toss together arugula with sun-dried tomatoes, spiced chickpeas, roasted romanesco, honey roasted pecans, and pesto vinaigrette. Serve. This salad can come together pretty quickly if you multi-task. Start by preparing the honey roasted pecans. These pecans are my ultimate favorite for any salad or even just a snack. Simmer the honey with the water and oil, add the pecans and finish by tossing them in cinnamon and sugar. It’s important to lay them out on a wax paper to cool or they will become one clump. If you don’t have wax paper you can also use parchment paper and spray it with cooking spray. While the nuts are cooling, roast the romanesco and chickpeas. Romanesco is one of those vegetables that you find in the grocery store and think, “What is that? !” It actually tastes similar to broccoli and is even sometimes referred to romanesco broccoli (or romanesco cauliflower, depending on where you are). If you haven’t tried this vegetable yet, give it a try. It’s GOOD. Otherwise, substitute with roasted cauliflower or broccoli. To test if the romanesco is done roasting, give the thick part of the stem a little poke with a fork. The fork should be able to pierce through when they are ready. While the vegetables and chickpeas are roasting, make the salad dressing. All of the ingredients except the red wine vinegar is what makes a pesto. Add the vinegar and you have a pesto vinaigrette. I’ve also done the shortcut and bought premade pesto (shocker, I know), added red wine vinegar and slowly finished with olive oil to emulsify the dressing. Either way, it works! 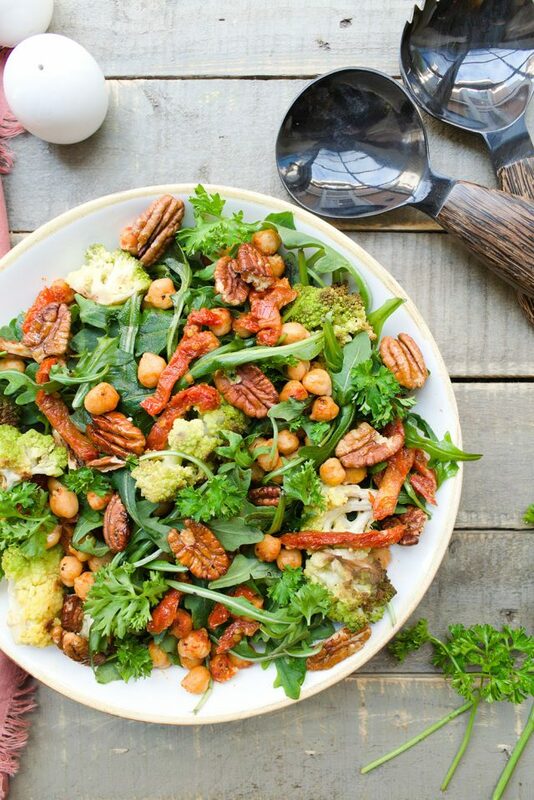 Serve this roasted chickpea romanesco arugula salad with chicken, steak, salmon, tofu, or just by itself and dig in. I love, love, love the flavor combination of this salad. 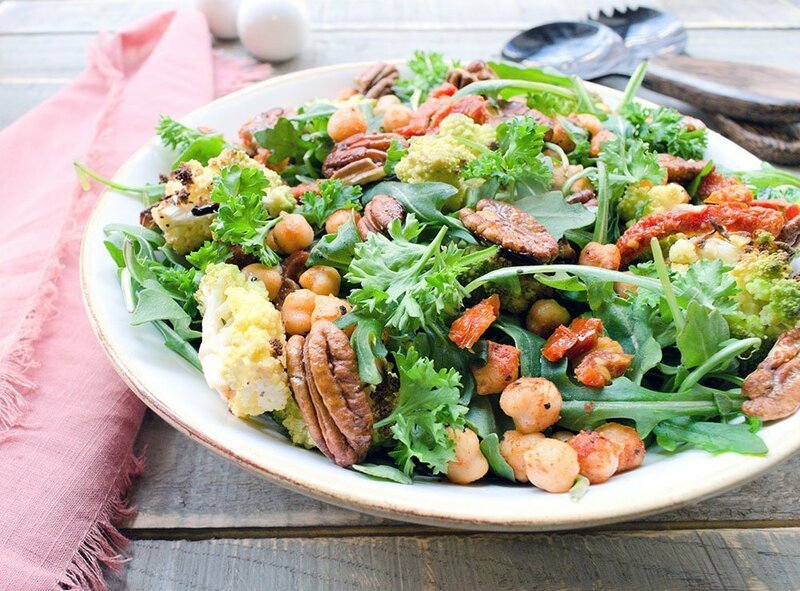 Sweet pecans with earthy romanesco, bitter arugula, spicy chickpeas, and tart sun-dried tomatoes… a little bit of everything in one bite!